We’ve had a very weird winter this year – well, it is probably normal but the last 5 years or so have been drought years so this year feels cold and wet in comparison. As a result, it has taken what feels like ages to warm up and I am frankly over the cold and want to put my winter clothes away this weekend. My garden has finally started to heat up and go crazy. It is lovely to see so much life after letting it go to waste over the winter. 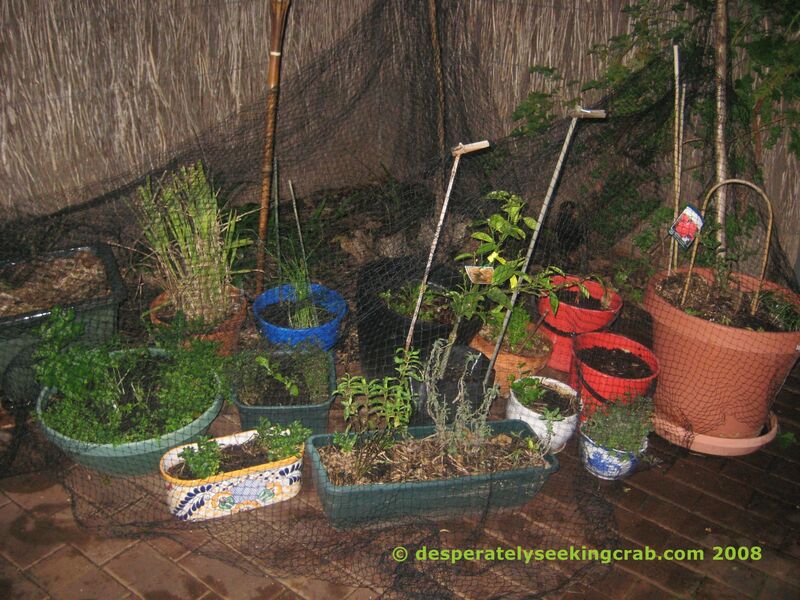 I don’t bother with winter veggies because I get ZERO sunlight during the winter in my garden – depressing? Yes. 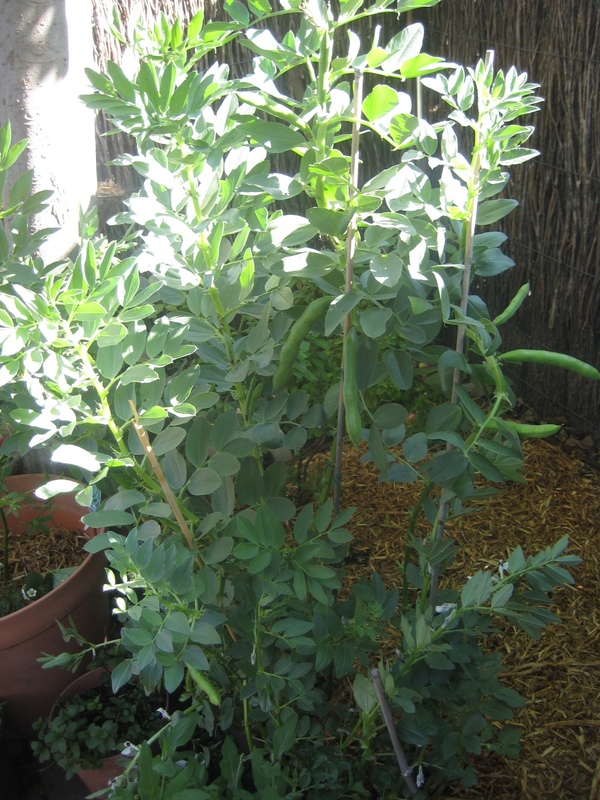 But this year, I finally planted FIVE broad bean (fava bean) seeds that an old (someone odd) lady gave me a couple of years back. I planted them just before I went on holiday to Hawaii and forgot about them. I came back to plants as tall as me and was amazed that I got a few pounds worth of beans with no effort at all! Finally, I have found something I can plant over the winter. 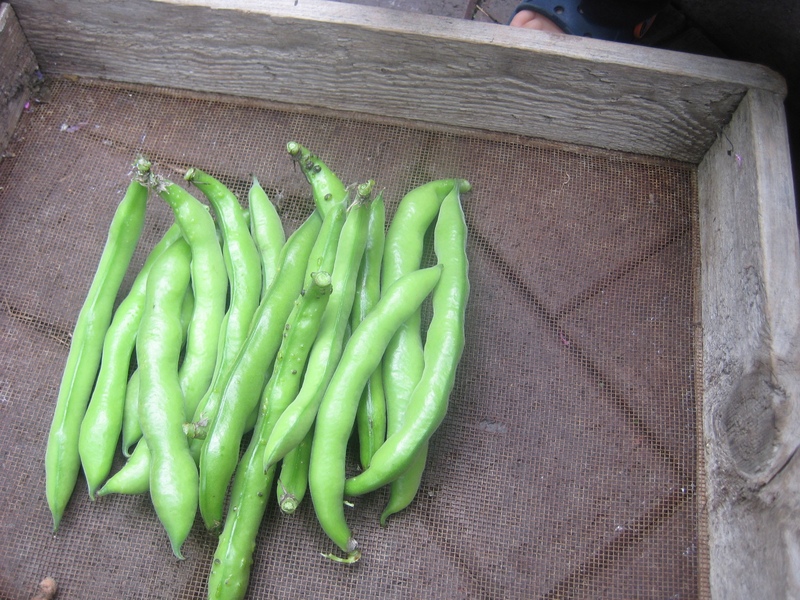 Plus, broad beans are good for the soil and give nitrogen back into it. I love picking them when they beans inside the pods are around a 5 cent Australian (or US dime) size and this year, my toddler helped me shell them too – it was very fun. Some people don’t peel the thick skin on the outside of each bean but I think it’s very tannic/astringent and rather detracts from the sweet, fresh beans so I always blanch it and refresh it in ice cold water and peel off the skin. 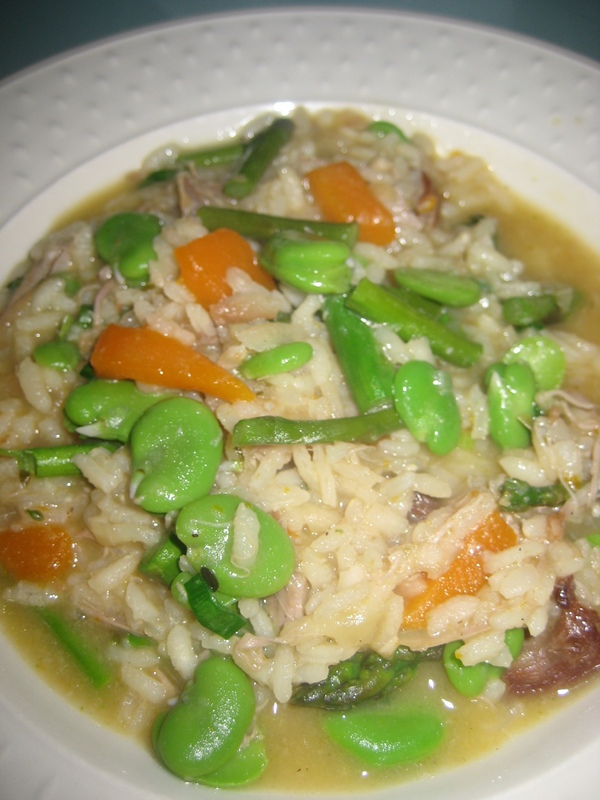 I made a spring risotto with the broad beans and added shredded chicken, carrots and asparagus and added the pre-blanched beans in at the end. It was divine. 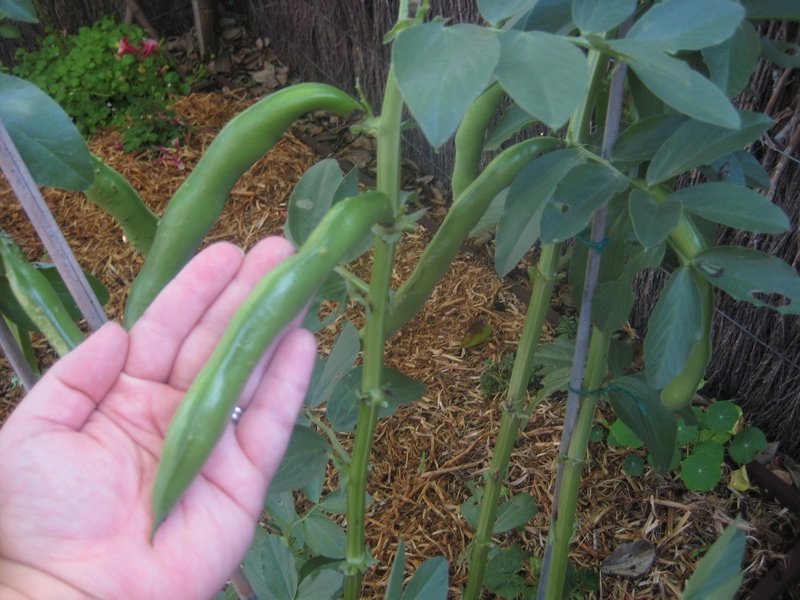 Although I didn’t grow a ton of beans, I learned just how easy they are to grow and that next winter, I’ll be planting a whole raised bed of them. Just be careful, too much overhead watering can cause rust which will spread and then eventually kill them. In a previous post, I was bitching about the tedious task of having to always have our garden draped with bird-netting due to these cuddly Ring-tailed possums that live and forage in most urban neighbourhoods around here. When I tell my friends in the U.S. that we have Possums, most think of those ugly triangular-faced creatures in North America. Possums here are marsupials, relatives of cute Koalas and Kangaroos but although cute, they wreak havoc on gardens…including mine. I have a love and hate relationship with them but I must confess – last year, I saw one walking along the top of my brush fence with a baby on her back and that was absolutely adorable. 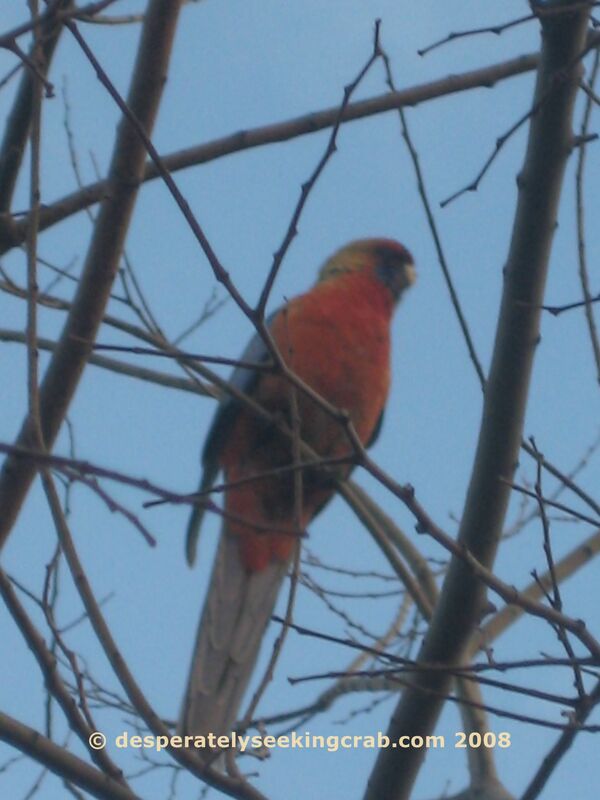 Well, I finally got a picture of one sitting in the neighbour’s Lilly Pilly tree. Australian Ring-tailed Possum: They may be cute but will decimate your garden. 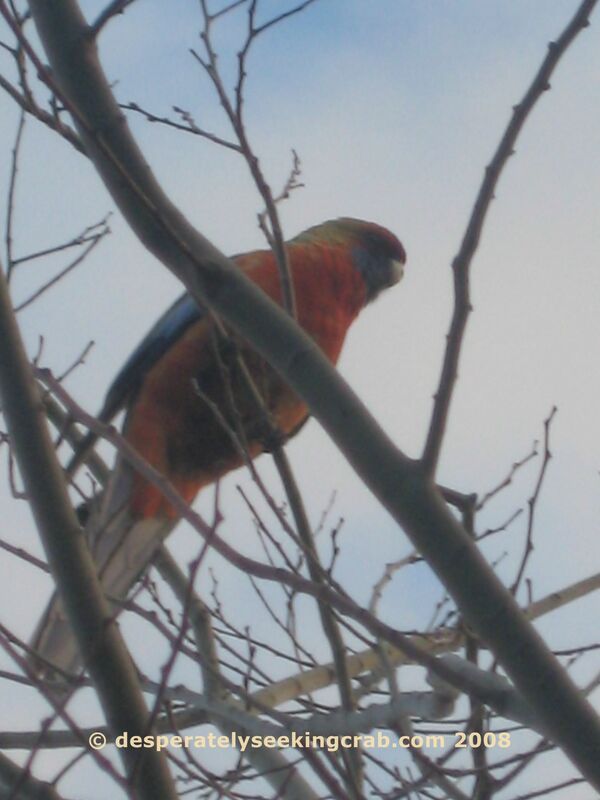 Anyway, here is another parrot – the Adelaide Rosella, that was in my garden over the weekend while I was trying to plant bok choy, sweet peas, green onions and peonies. 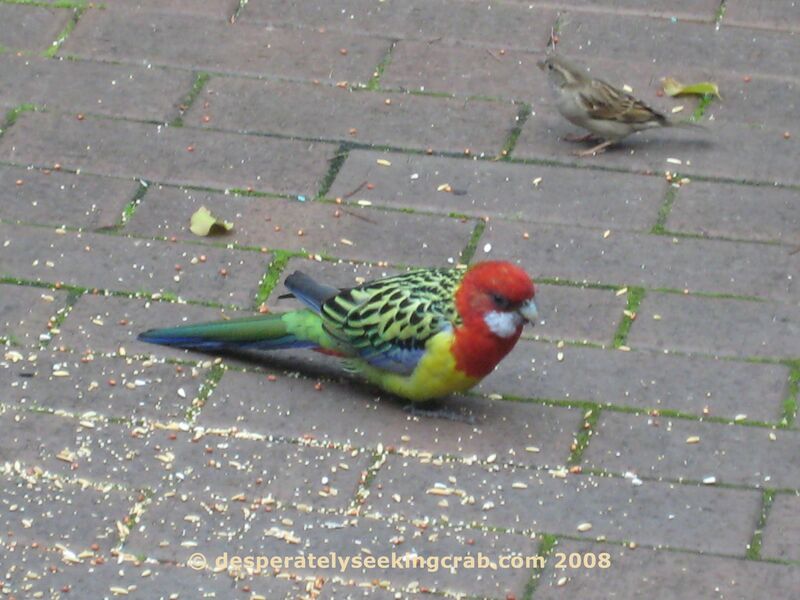 Adelaide Rosellas are a cross between Yellow Rosellas and Crimson Rosellas (bright red & gorgeous). 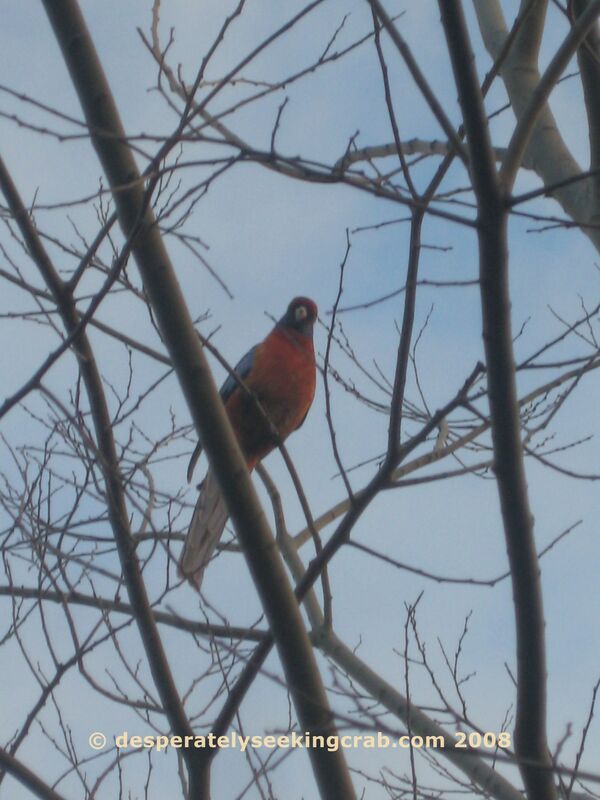 This guy was eating the red berries in the tree next to my fence. This post isn’t about food but I couldn’t resist sharing these photos. Winter is a pretty dead time in my garden (plant-wise) but it is the time of year when I put out bird seed and everyday, I get excited by the different varieties of birds that visit me. 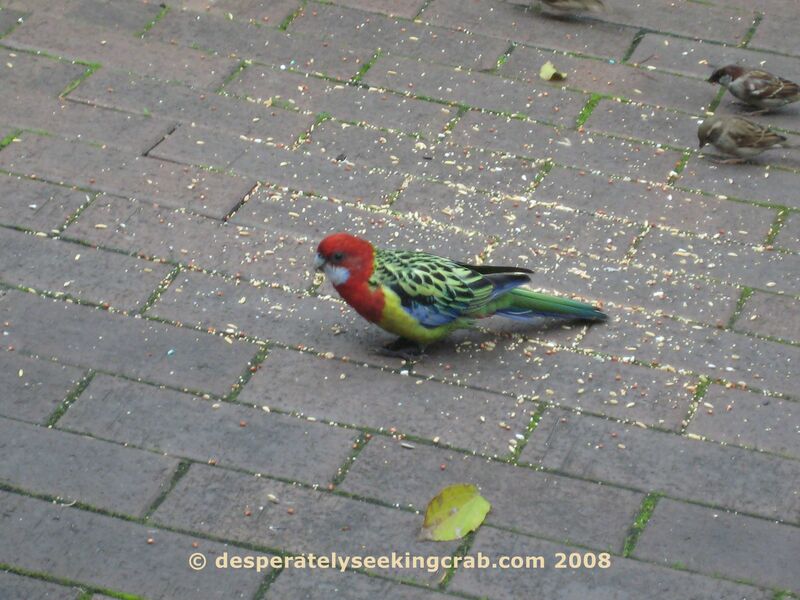 The wonderful birds & wildlife is what I love most about Australia. In my garden, crested pigeons are the most common and so are sparrows but occasionally I get the odd magpies and very very rarely, do I get a parrot species.